During my sluggish days and when my curd becomes sour, I make this Mor Kuzhambu. 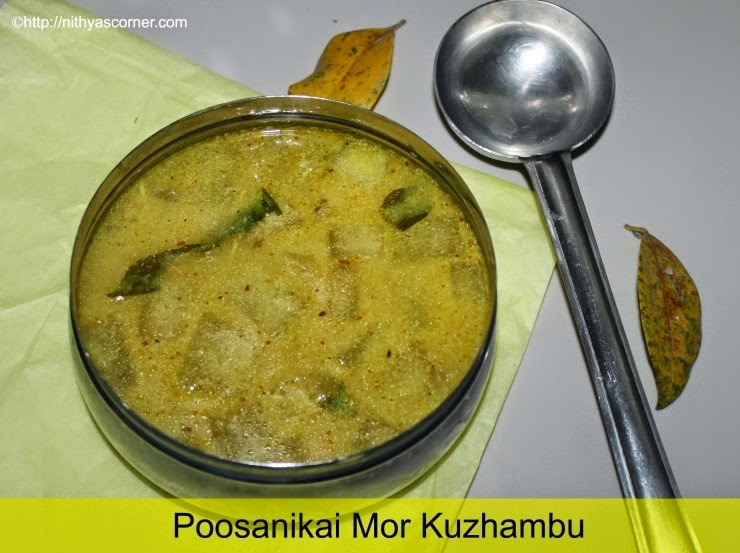 What I like about the Poosanikai Mor Kuzhambu is the mild flavor of white pumpkin, and also it is very soft when you bite the white pumpkin. Very easy to make and no cutting work is needed except for the cutting of white pumpkin pieces. When you do not have onion and tomatoes in kitchen, you can make Mor Kuzhambu. 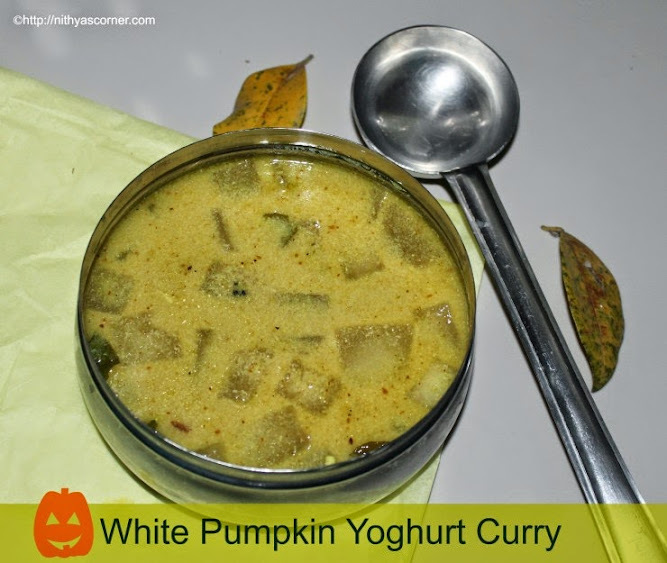 Though I have already posted Cucumber Moru Kootu in my blog, I thought I should also post a different version of Mor Kuzhambu and this time with White Pumpkin. I usually love to have it with Potato Fry, Kovakkai Fry / Tindora Fry, Plantain Poriyal and Brinjal Pirattal. Whenever I have guest at home, I will have this dish as an option. 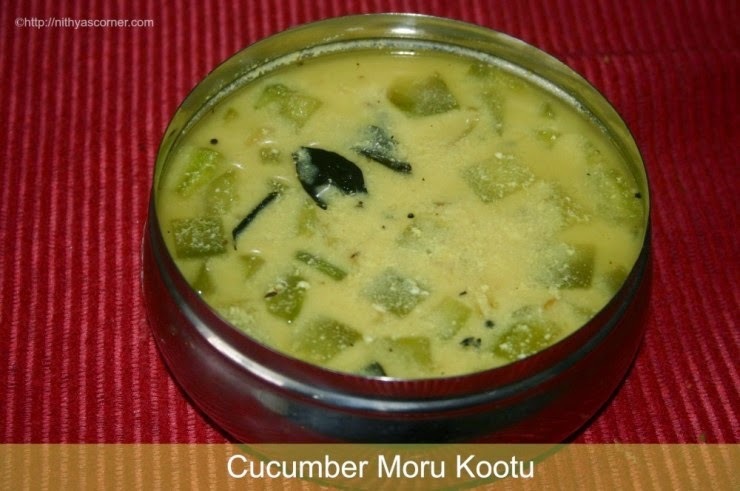 After all, who would not like Mor Kuzhambu? 1. In a small pan, heat 1/2 teaspoon of oil and fry red chillies, urad dal, and fenugreek seeds until they turn golden brown. Let it cool down. Then grind them to a fine powder along with coconut, turmeric powder, 1 teaspoon of cumin seeds and little water. 2. Heat 1 tablespoon of oil in a pan. When the oil is hot, add mustard seeds and rest of the cumin seeds. When mustard seeds splutter, add the white pumpkin pieces. Fry for two minutes and then add curry leaves. Fry for two more minutes. 3. When white pumpkin pieces are 3/4th cooked, add the ground mixture. Stir well and then add 1.5 cups of water. 4. When the mixture starts boiling, add the buttermilk. Simmer the flame immediately and continue to cook for 10 to 15 minutes. Do not cover with lid and cook. When the Mor Kuzhambu thickens, switch off the stove. Now, Poosanikai Mor Kuzhambu is ready! 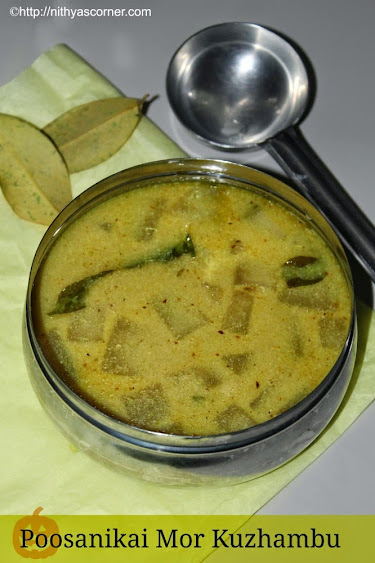 You can add boiled vegetables of you choice like drumstick, ladies finger, chow chow/chayote, colacasia/arbi/sepankizhangu, brinjal, urad dal vadai, ripe mango, thoothuvalai keerai, potato, cucumber, manathakkali vattral, sundakkai vattral, vendhaya keerai (fenugreek leaves) and surakkai etc. Do not forget to simmer the flame else it will curdle. Do not cover with lid and cook. The mixture will curdle. If you are using sour curd, whisk the curd well if not it will curdle. This entry was posted in Mor Kuzhambu and tagged Mor Kuzhambu, Poosanikai Mor Kuzhambu, Tindora Fry on November 22, 2014 by vikashbhardwaz. I buy cucumber a lot that too in large quantities. I buy them once in two weeks. I try to make as much recipes as possible with cucumber. 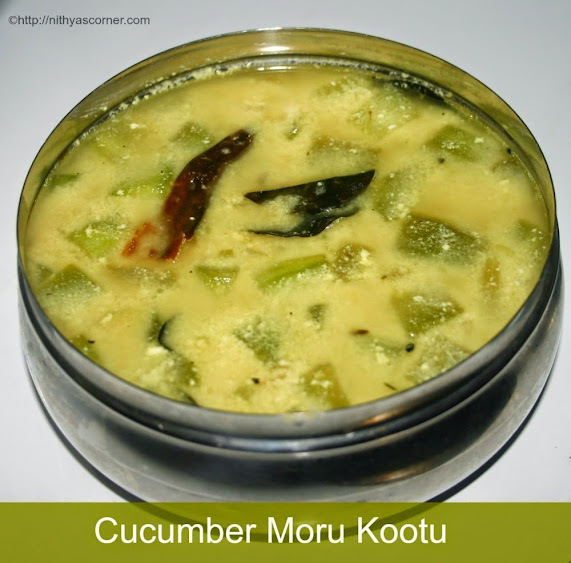 Cucumber Moru Kootu is one of my favorite recipes that I make often. My family loves it so much. Slit green chillies – 3 nos. Finely sliced shallots/small onions – 5 or 6 nos. Red chillies (kanja molaga) – 3 or 4 nos. 1. Heat oil in a pan and add mustard seeds (kadugu), cumin seeds (seeragam), and fenugreek seeds (vendhayam). Once mustard seeds splutter and cumin seeds sizzle, add shallots/small onions and red chillies. Add minced ginger and curry leaves. Now add cucumber pieces and salt. 2. Add little water and cook for 2 minutes. Then add turmeric powder and slit green chillies. Cook for 5-7 minutes or until the cucumber pieces become soft. Meanwhile, blend the curd/yogurt along with 1 cup water. Pour the yogurt mix into the cooked cucumber and stir continuously. Simmer on low heat for 5 minutes. Never allow the curry to boil. Keep on stirring for a few more minutes. Add more salt if required. Now, Cucumber Moru Curry is ready! This entry was posted in Mor Kuzhambu and tagged cumin seeds, Curry Leaves, Poosanikai Mor Kuzhambu, Vendekka Moru Kuzhambu on November 22, 2014 by vikashbhardwaz.